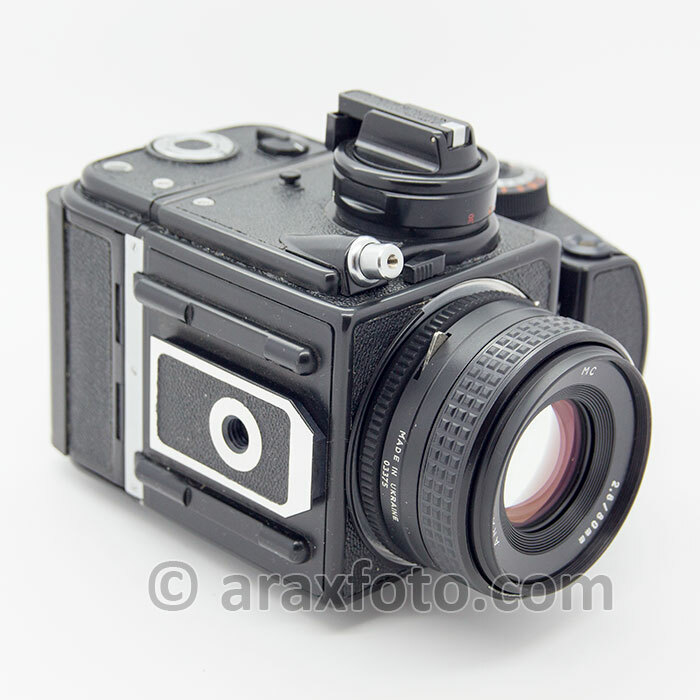 ARAX-CM/MLU medium format film camera kit. ARAX-CM/MLU standard kit. Black or chrome finish. 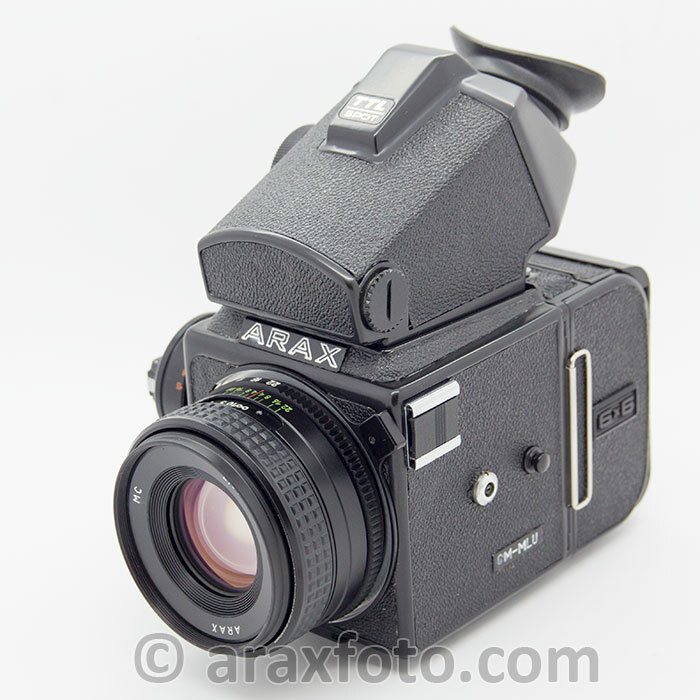 The ARAX-CM-MLU kit is a highly upgraded version of KIEV-88CM. 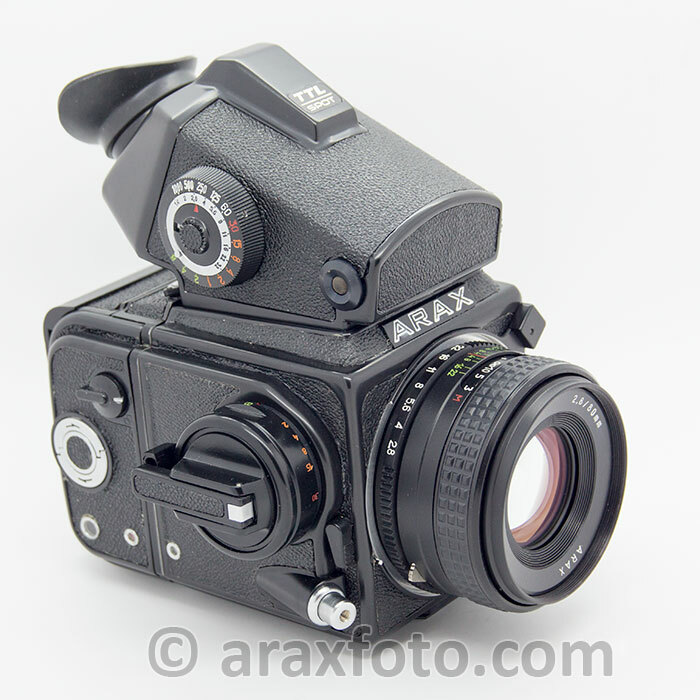 It is a fully mechanical 6x6 medium format SLR camera with breech-lock lens mount redesigned and upgraded by ARAX. 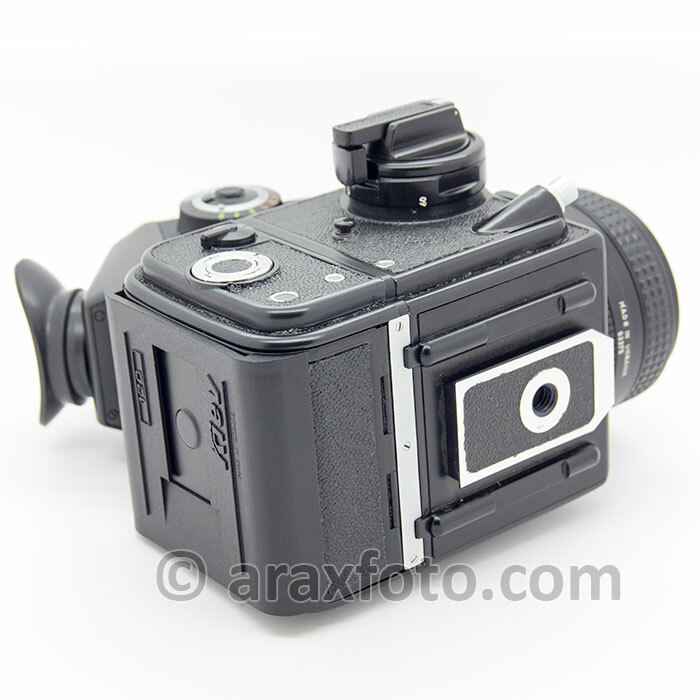 This camera has been individually upgraded by hand from new original cameras and tested by the best technicians. These are not production line units! Our MLU (Mirror Lock Up) system operates independently of the shutter button. You can lift the mirror separately without using the shutter release. When you push the shutter release, the mirror lifts up automatically as usual. MLU eliminates any vibration caused by the mirror movement when doing macro photography or when working with long focal length lenses. 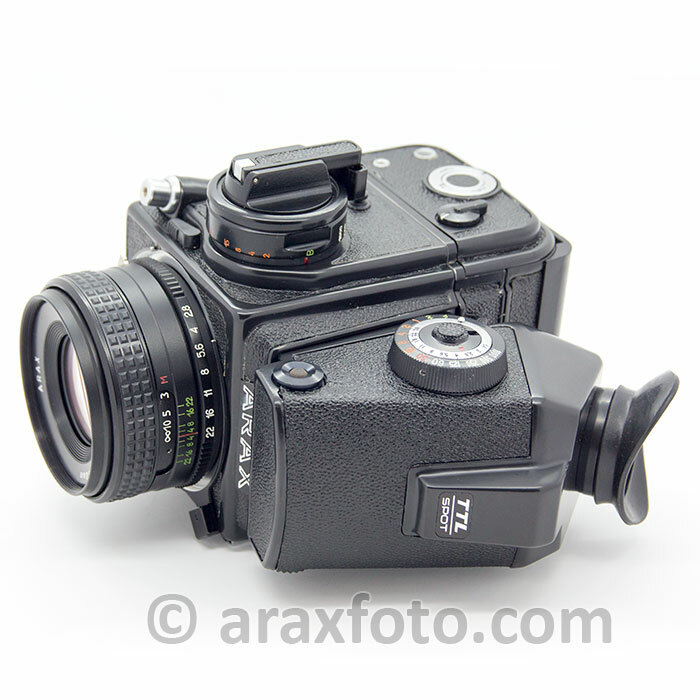 The major difference from its many predecessors and competitors is its new Pentacon Six breech-lock lens mount redesigned and upgraded by ARAX. The camera features a black cloth shutter and flocked interior for quieter and more reliable shutter action and fewer reflections within the camera body. And, it uses the newly designed film backs designated NT (new type) which are much easier to load than the old ones. 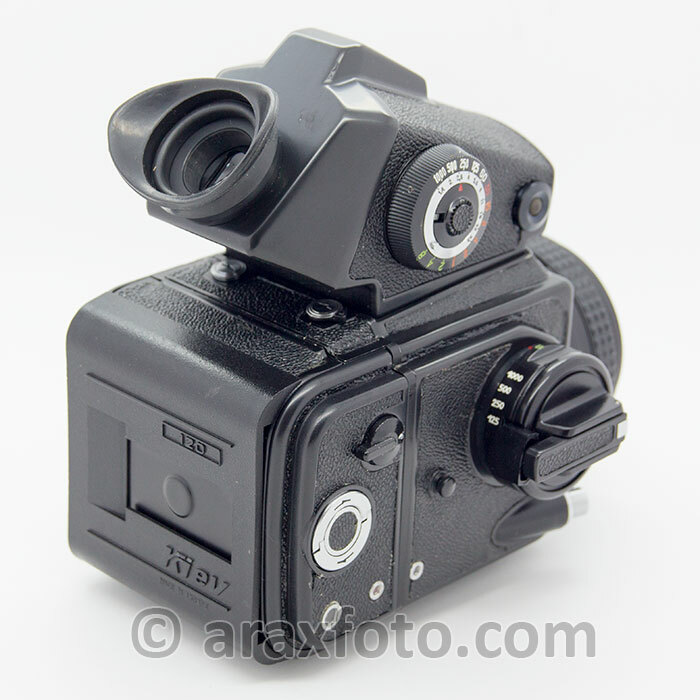 The camera body, magazines, prisms and folding waist level finder have a light-absorbent durable black finish. Our redesigned and upgraded ARAX-CM breech-lock lens mount really allows the use of the full range of interchangeable lenses (Schneider-Kreuznach, Carl Zeiss Jena [including Sonnar 2.8/180], Meyer, Arsenal and others). These range from the 30 mm ARSAT Fisheye right up to the 1000 mm Pentacon. ARAX-CM-MLU cameras have a special durable light-absorbent black finish. The chrome is removed by a sand blasting process and the new finish is reapplied. All ARAX cameras comes with specially designed high impact ARAX camera bag, perfectly defending your precious ARAX gear from impacts and accidental falls.